The photos do not lie people. Photos can be made to say anything you want them to say. They can even be made to lie without being Photoshopped. Well said, context, context, context....I am not going to argue with those of the 'true' mindset as their minds are set. I do take exception to putting quotation marks around the use of the word 'Orthodox' in connection with hierarchs of our canonical Orthodox churches. If this continues, others will likely reciprocate regarding those who have chosen to separate themselves from the body of the Church and the tone and tenor of our discussions will suffer greatly. But IF--and that's a big IF--an Orthodox bishop has betrayed the faith by participating in an illicit worship service with heretics, is it not appropriate to call his Orthodoxy into question by calling him an "Orthodox" bishop? The real problem I see is the quickness to condemn Metropolitan Augustine over a few possibly doctored/out of context photos when we don't know all the facts. The real problem I see is the quickness to condemn Metropolitan Augustine over a few possibly doctored/out of context photos when we don't know all the facts. Every Orthodox Christian worldwide that accepts ecumenism denies the canons and Orthodox tradition. The photos do not lie people. Have you heard of Photoshopping? In this case, it is a true picture. Conservative German Catholics also are outraged because their Bishop accepted having his cross painted by a Lutheran woman. 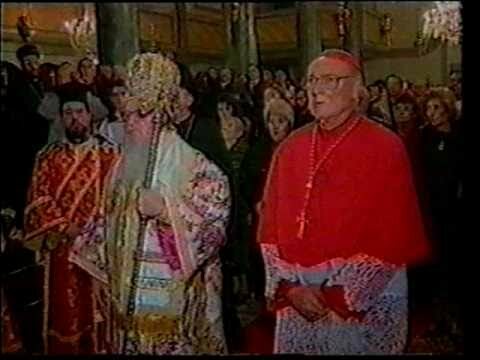 Did not Patriarch Kirill send his representative to the Assisi 2011 ecumenical prayer service where Pope Benedict XVI submitted by bowing his head to receive a blessing from a Voodoo priest? Ever since my chrismation in GOARCH, I have received one shock after another due to the ecumenical pontifications from Greek and Antiochian priests and bishops. These canon-breaking hierarchs have shown no repentance for their scandalous actions. The actions of the OCA hierarchs (with the exception of Metropolitan Jonah) have also been scandalous. Finally, I could take it no longer. I took the plunge into the GOC where I have yet to meet arrogant priests and laity. Instead, we are constantly reminded to pray and repent. And frankly, I have not seen any adulterous actions of the True Orthodox. Certainly, they are not ecumenists who associate with Buddhists and other non-believers. Certainly they do not tell Catholics to become better Catholics and Jews to become better Jews as did several GOARCH priests. Instead, the GOC priests humbly bid all to come and receive the Holy Waters of Baptism. Come and see that the Lord is good. This is what surprised me in my journey into True Orthodoxy. As before when I was in the Antiochian Archdiocese I had a preconceived notion that the Old Calendarists were pretty much a bunch of legalistic schimastics, many of whom were probably at least a little bit loony. But when I actually met Old Calendarists in person my views have dramatically changed. Sure, I have met a couple of people who have been quite legalistic and a little loony, but the majority of the Old Calendarists I have met so far have been level-headed and Christ-like individuals. The problem I think is partly because there are loony and legalistic Old Calendarists who do a lot of posting on the internet and when people read what they post they think to themselves that all Old Calendarists must be like that. Honestly I had previously thought that the "ring leaders" of the "cultish" True Orthodoxy were probably similar to people like Br. Nathaniel Kapner and Bp. Gregory of Colorado. Even though neither of those people are True Orthodox, that was just my impression on what the True Orthodox were probably like. Another problem is that there are True Orthodox people who constantly, and just about solely, post and attack the Ecumenical heresy, so that readers respond with "Alright, we get it, you're against Ecumenism. Is there anything more to your 'True Orthodox' faith other then attacking Ecumenism or is that it?" Yes, Ecumenism is wrong and the Orthodox Church is obligated to stand against this heresy and to educate it's people in this matter. But the goal of our True Orthodox faith is to be united with Christ, not to solely attack Ecumenism (or any other heresy for that matter). Our focus needs to be on Christ, not on Ecumenism. Thirdly, a problem is that the True Orthodox are divided among ourselves, as we are made up of various synods, some of which are in communion with some, and other synods who are in communion with no one. How is it that we claim to be the One Holy Catholic and Apostolic Church and yet allow so much division? Members of the True Orthodox Church shouldn't be divided among ourselves. There should be a striving to break these divisions. While the unity of the Church is not broken by temporary divisions of a non-dogmatic nature as can be seen throughout the history of the Church, nevertheless the breaking of these divisions should be striven for, for what we have today is somewhat of a mockery of the Church. Another problem is that there are True Orthodox people who constantly, and just about solely, post and attack the Ecumenical heresy, so that readers respond with "Alright, we get it, you're against Ecumenism. Is there anything more to your 'True Orthodox' faith other then attacking Ecumenism or is that it?" No, because there was no such thing. You're probably thinking of the inter-faith meeting for peace. And I seriously doubt that it involved Pope Benedict bowing his head to receive a blessing from a Voodoo priest. Just like the Pharisees of old, if current members remain in World Orthodoxy with its rampant ecumenism, then they risk losing their salvation. I know some choir members of GOARCH who devoutly sing the Paracleisis, but some hierarchs and clergy in the Greek and Antiochian churches are slowly phasing out Supplicatory prayers to the Theotokos. Would this be from the ecumenical influence of protestants? The excuse some of these hierarchs give is that clergy and parishioners cannot find the time to attend these services. Lord have mercy. Vespers in many parishes has already been abandoned or is slowly being phased out. Lord have mercy. Today, there are many who are sick with the same diseases and yet they call themselves Orthodox and have titles of bishop or priest or the status of an “elder,” despite the fact that they support teachings condemned by the Church. In these cases we must remember the words of Saint John Chrysostom “that agreement is not in all cases good, just as division is not in all cases evil.” In his commentary Saint John implied that it is essential to separate from such men in order to even begin to understand the truth. Maria, I might not agree with you on some things, but I agree wholeheartedly with the above. The Orthodox Churches are doing what the Protestants did centuries ago, they are forming their theology by being in opposition to the Catholic Church. In other words, if something is Catholic doctrine, then it has to be wrong so let's get rid of it. I was appalled years ago to hear a priest mock the Catholics for calling our Theotokos 'Mediatrix', and because of that whenever I would get the chance, I would quote Saint Gregory Palamas. He said that our Theotokos contained within her womb the Creator of Heaven and Earth and thereby became the boundary that united heaven and earth, and that no one not even the saints can go to heaven unless they go through our Theotokos. Hi Zenovia. Would I be right in thinking that you're agreeing with part, not all, of what you quoted? And, if so, what part? It this the same kind of thing as when Pope JPII kissed a Koran supposedly? It hurts where it counts... Trust me I know... I wish some of you would quit denying what is happening and start speaking out against it. Are you Orthodox Christians or not? Or shall we just brush aside the Great Schism and become under papal supremacy? Wow just wow... This bishop makes me sick. At least the Amish don't have Bishops. Amish do have bishops. They cast lots for them. Could you prove the CCC issue? On the one hand, I have met a lot of saintly people within World Orthodoxy, people who are willing to forgive, turn the other cheek, and who would share their last $100 with a beggar, and not question if that beggar would use that money to buy an alcoholic drink or a cocaine fix. That's what I call "irresponsibility". And is it not surprising that some Byzantine Catholics have also joined the Sedevacantists? Would that they would come home to Orthodoxy. Pidhirtsi fathers protest against removing the latinisations from their services. I attended the Antiochian Priest's retreat years ago, sometime at the turn of the 21st century, and ordered the CDs for which I had paid a large sum of money, but the Cathedral decided not to give them to me nor refund my money. Yes, the CDs are out there, but I was never given the copies. Both Father Thomas Hopko, who gave the retreat, and Bishop Joseph, who gave the keynote presentation, assured us that the Catechism of the Catholic Church (CCC) had nothing in it that was contrary to the Orthodox faith. I was shocked because the CCC does pontificate about Papal Infallibility and Papal Supremacy. Perhaps the hierarch was overlooking that part of the CCC in his enthusiasm when he discovered that the Melkite Eastern Catholic theologians had indeed introduced much Orthodox doctrine into the CCC. For example, if you have read the part on repentance, confession, and growth in theosis in the CCC, it does sound very Orthodox in doctrine. You are only fooling yourself. 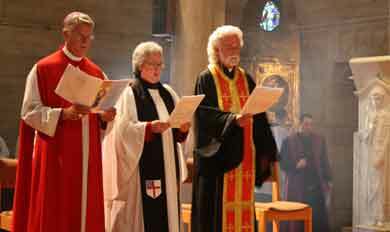 Lots of bishops / clergy have been engaged in ecumenism. I love it, when somebody wants proof on the forum, they want a photo, text, links, etc. When somebody provides proof on the forum, then it is photoshopped. Denial will only make you feel better for a while... Been there done that. The truth resonates in ecumenism and its obvious. I know you guys are smart enough to buck up and see the reality behind it. It takes a lot of strength to stand up against a bishop/metropolitan engaged in direct heresy and breaking the canon of the Holy Apostles. I pray that some of you can do some soul searching on ecumenism. I encourage everybody to find a bishop that opposes the practice. I'm sure that everybody would like to be Orthodox without their bishop practicing acts forbidden in the Canon of the Holy Apostles. Ask yourself the simple question (pretend somebody asked in the Faith Issues section and they were an Orthodox Christian) "Is it okay for me to attend a Roman Catholic church for prayer and worship"? The answer is "NO". Here you have bishops, clergy, and in the OP, a Metropolitan breaking the canon and ENGAGING IN WORSHIP with the Non-Orthodox. Many Orthodox are against this as well, and I really wish many Orthodox would get brave and decide to start going through the ranks with messages against ecumenism. Forgive my ignorance....CCC? Please clarify. I get your point but just to clarify, the priest on the third photo from the top is eastern catholic. Both Father Thomas Hopko, who gave the retreat, and Bishop Joseph, who gave the keynote presentation, assured us that the CCC had nothing in it that was contrary to the Orthodox faith. I was shocked because the CCC does pontificate about Papal Infallibility and Papal Supremacy. Perhaps the hierarch was overlooking that part of the CCC in his enthusiasm when he discovered that the Melkite Eastern Catholic theologians had indeed introduced much Orthodox doctrine into the CCC. For example, if you have read the part on repentance, confession, and growth in theosis in the CCC, it does sound very Orthodox in doctrine. Like you I believe there is wonderful people overall in the Eastern Orthodox church body. I also believe that many Orthodox Christians are too scared to approach the clergy on this subject. Either that or they just like their church and are comfy in their situation. Orthodoxy is Orthodoxy because it is supposed to be "ORTHODOX". Things are not supposed to C-H-A-N-G-E. That is why there has not been an ecumenical council since 787 (then the G. Schism) by the Orthodox. RC's have had many councils since. The church body is frightened of ecumenism. I mean, can you imagine your bishop going into an RC church to hold joint services? The bishop has a lot of power, and often the priests would be scared of him to confront him. They are either in on it (ecumenism) for various reasons, or they are too afraid to stand up against it. I don't entirely know which other Orthodox groups are away from ecumenism except for HOTCA and Bishop Gregory in Colorado (I've heard some stuff, but his ordination came through ROCOR). ROCOR has been in and out so I never know their status. OCA, GO, Romanian, Antiochian, are all neck deep in ecumenism. Lord have mercy! Yes, Bishops Gregory and John of Colorado are quite eccentric and are not considered True Orthodox. Furthermore, they believe that they are the only Orthodox in the entire world and that the sacraments of World Orthodoxy and the True Orthodox are graceless. For example, if a group of people were to undergo catechesis in Bishop Gregory's group, they would have to accept Baptism to be a member of his church, even though they had been baptized into the GOARCH, Antiochian Orthodox Church, or GOC by triple immersion. On the contrary, if a member of the GOARCH were to convert to the GOC, they would be received by Chrismation, not re-baptism. However, if a member of the Bishop Gregory's church were received into the Serbian Orthodox Church, they would probably be received by chrismation and not be re-baptized. Nevertheless, if a person from one of the true Orthodox jurisdictions switched from one jurisdiction to another, they most likely would be received by confession of faith, as Baptism is recognized. Yes, this is confusing, but again, it is largely due to eccentric hierarchs like Bishops Gregory and John of Colorado, so we must pray for them, and hope that they are not becoming senile. Here's a good website which shows all of the Orthodox synods that are in America who are opposed to Ecumenism and are separated from the World Orthodox Church. ROCOR has indeed a shaky history with regards to Ecumenism. This is why there has been a few splits from ROCOR, so that today there is one ROCOR synod in communion with World Orthodoxy, and a handful of ROCOR synods who reject Ecumenism and are not in communion with World Orthodoxy. BTW, Bp. Gregory of Colorado has been deposed by two Greek TOC synods and one Russian TOC synod, so I don't think anyone considers him as being a bishop of the TOC. Thats the problem. It appears to me that the only authority this so called TOC accepts is leadership they agree with. So therefore, this Bp. Gregory has the same legitimacy as the TOC. This TOC does not accept the canonical leadership of "world orthodoxy" so it seems to me, that under the same premise, this Bp. can not recognize the TOC and be perfectly fine, using the same criteria that the TOC uses to be schimatics, Bp. Gregory can use too. It all sounds awful baptist-y to me. Well, I have met both of them at the same time, and had quite and extensive talk with them. (Bishop John by the way is probably one of the tallest men I've ever seen). The way they view things are that if you were baptized in an EO faith that was engaged in ecumenism, by the Canon of the Holy Apostles, those bishops were actually defrocked, no longer bishops nor clergy, and the baptism or sacraments (such as priests ordained by the self defrocked bishops engaged in heretical ecumenism), never were valid. Now, they did say that priests who have been priests but want to be "officially ordained" under them, could be ordained by them. (Ones who understand). They went as far as to ask the date & where I was personally baptized as an infant, and the certain church was not under an ecumenism jurisdiction so they held my baptism as valid. However, if it was a few years later, the jurisdiction joined the WCC & Ecumenism, the bishops engaged in worship with other Christians (than Orthodox), and were then "invalid". They also directly told me (I kid you not) that they would consider themselves in communion with HOTCA, but do not think that HOTCA is in communion with them. This is their quote from a question I asked both of them right in front of me. They seemed to have a very open heart to HOTCA. I am speaking as a layperson, with no idea of the details, but just relaying what I directly heard. My question was "Are you in communion with HOTCA". I do believe if the bishops of HOTCA and them had a good sit down, heart to heart, something could be worked out.... I say that in the good attitude and openess they seemed to have towards HOTCA... They really seemed to believe that HOTCA had true grace & Orthodoxy. Bishop John was a very kind man, and Bishop Gregory was very smart, but also sternly direct in his love for Orthodoxy. If they said that, then I'm as surprised as you. Orthodoxy is Orthodoxy because it is supposed to be "ORTHODOX". Things are not supposed to C-H-A-N-G-E. That is why there has not been an ecumenical council since 787 (then the G. Schism) by the Orthodox. Thanks. This disclosure gives me hope. Let us pray for Bishop Gregory and Bishop John and for the Hierarchs in the GOC. Wow, those guys are pretty funny. I'd love to see that battle. The fact that Bp. Gregory, after being deposed from one TOC synod, was accepted by another TOC synod is a sad reality that we face today in the Church. These divisions among the various TOC synods is scandalous and makes it easier for these uncanonical actions to take place. But these uncanonical actions have no affect on the Church in regards to its oneness, holiness, catholicity, and apostolicity (not sure if that last one's a word). I'm not sure how these divisions are regarded as baptist-y to you as I do not know much about the Baptist denomination (unless Baptists all share in the same faith but remain divided into various synods mainly due to persecutions, historical circumstances, and misunderstandings). I understand how the TOC can be compared to Protestantism as a whole but I think this comparison is wrong, as unlike the various Protestant denominations, the various TOC synods all share in the same faith. I've often heard the Protestant comparison before, and I have often heard that the World Orthodox claims of being Orthodox are much like the Papal claims in the sense that one has to be in communion with the Ecumenical Patriarchate or the Moscow Patriarchate in order to be considered Orthodox. The Orthodox faith of the various TOC synods (and the faith of the synods of whom they are in communion with) should be the factor that certifies them as being Orthodox, not whether or not they are in communion with World Orthodoxy (especially if there is heresy in the World Orthodox Church as the TOC believes there is), as St. Ignatius said, "Wherever the bishop shall appear, there let the multitude [of the people] also be; even as, wherever Jesus Christ is, there is the Catholic Church." When St. Ignatius says the word "bishop" we can safely assume that he means an Orthodox bishop, a bishop who has an Orthodox faith, a bishop of the Orthodox Church, and a bishop who doesn't practice or preach heresy. So in this regard, even though our various TOC synods are visibly separated from each other, this does not mean that the various TOC synods are not all members of the same one holy catholic and apostolic Church. And while yes, it is possible that the multiple synods who have deposed Bp. Gregory are in the wrong and he is in the right, one can meet Bp. Gregory themselves and look into the reasons why he has been deposed by multiple TOC synods to come up with their own views on if his claims are as legitimate as the claims of the multiple synods who have deposed him. Just because someone can believe that a synod is legitimate doesn't make it true. So even if Bp. Gregory can make a legitimate claim of being a TOC bishop does not make it true. Catholics can make legitimate claims on being the one holy catholic and apostolic Church, but both the True Orthodox and World Orthodox would say that they are not. Even though these are confusing times in the TOC, this doesn't mean that anyone can just splinter off and form their own synods at a whim because of their own worldly desires or delusions and still be considered to have a legitimate claim of being a TOC synod. Yes, you can accuse the TOC of being just that, a group of splintering synods who have broken off from World Orthodoxy because of their own worldly desires and delusions, but after reading for myself the history of the TOC and some of the various synods histories, I refuse to believe that as I know that it's false. I took a brief glance at that website, and quickly closed it. But this is the same thing that can be said of those who splinter off from the TOC. The problem is, the TOC can not attack anyone who leaves them, since they use the same criteria that the TOC used to split from Orthodoxy. These Bishops might look at the TOC as wrong (or in error), just as the TOC views the Orthodox Church as wrong. The problem is, they're all using the same criteria. The TOC can not attack these bishops for doing something that the TOC themselves did. Its "Do as I say, not as I do" all over again. Its is all personal interpretation of the canons when it comes to this stuff. I'd say so. They have a whole article on how the popes who condemned Jansenism were heretics. You realize that if you (correctly) define uncanonical and scandalous actions as "praying with heretics", the above is exactly what those of us in communion with Metropolitan Augustine say--except in our case it's true because we are all in communion. As opposed to the TOC denominations who cannot claim oneness when they are not in communion (the catholic and apostolic definition of that term). Either one of them is the true church and the others are all schismatic or they are all schismatic--but the idea that 'we're all one, holy, and catholic' because we share the same faith even if we're not in communion is exactly the 'invisible church' heresy the TOC falsely accuse the Orthodox Church of dabbling in to justify their schism in the first place. As I said...sounds kind of baptist-y to me. World Orthodoxy in the USA also seems so "protestant" by having so many bishops and cathedrals in the same city. No matter which way you look at this situation within Orthodoxy, it is scandalous to the non-Orthodox to see World Orthodoxy and True Orthodoxy so seemingly divided into various jurisdictions. It is only when the neophyte undergoes catechesis that the confusion concerning the various Holy Synods and jurisdictions is addressed, and then not very satisfactorily. Come Lord Jesus, and save us. No, not really. Because we share the same faith and communion. That can not be said of protestants. Scandalous would not be the word I would choose....confusing is the word I'd use. I understand it fine. So did the other catechumens with me. The only time it gets confusing is when groups claim to be the "true orthodox" or the "real orthodox" or the "holy orthodox" or any other used-car salesman's techniques, but are not in the same communion...half the time, with each other. Does an Amish bishop have contact with any of his counterparts in other religious denominations? Could he be accused of ecumenism? The difference is that that, from the TOC perspective, the World Orthodox are breaking canons AND are preaching and practicing heresy. And as stated by Protopresbyter Michael Pomazansky in his third edition of Orthodox Dogmatic Theology published by the St. Herman of Alaska Brotherhood, "The unity of the Church is not violated because of temporary divisions of a nondogmatic nature. Differences between Churches arise frequently out of insufficient or incorrect information. Also, sometimes a temporary breaking of communion is caused by the personal errors of individual hierarchs who stand at the head of one or another local Church; or it is caused by their violation of the canons of the Church, or by the violation of the submission of one territorial ecclesiastical group to another in accordance with anciently established tradition. Moreover, life shows us the possibility of disturbances within a local Church, which hinder the normal communion of other Churches with the given local Church until the outward manifestation and triumph of the defenders of authentic Orthodox truth. Finally, the bond between Churches can sometimes be violated for a long time by political conditions, as has often happened in history. In such cases, the division touches only outward relations, but does not touch or violate inward spiritual unity." It is not heresy to believe that temporary outward divisions between various Orthodox synods violates the oneness of the Church. The invisible church theory teaches that those of various Christian denominations and churches who are visibly out of communion with each other are in some way invisibly united as one Church, which is not the case in the TOC today as we are all synods of the same Orthodox Church, just temporarily divided at this time. There have been other times in Orthodox history when divisions arose (granted they have been on a smaller scale than what we have today) but this is in no wise the invisible church theory. We believe that the Church is guided by the Holy Spirit into all truth, and we believe it was the Holy Spirit which led us to break communion with the Churches who adopted the revised Julian calendar, which we understand as being an offspring of the heresy of Ecumenism. What do you think I'm trying to say here? I've never denied that a number of clergy have been engaged in ecumenism, whatever you mean by that term. In this discussion I've only been talking about the photos of alleged illicit behavior by Metropolitan Augustine. 1. In this discussion I have represented only myself and my point of view. I would appreciate you addressing me directly and not lumping me together with this nebulous "they". 2. I don't ask for photo proof of allegations, since I know how photos can be doctored or ripped out of their context. 3. Text or links cannot be photoshopped, so I feel comfortable asking for those. 4. I never made the positive assertion that the photos in the OP definitely were Photoshopped. I only posited the possibility that they may have been Photoshopped and that we should therefore not trust them by themselves. I'm not denying anything. I just want to make sure that before we convict His Beatitude of nefarious conduct we first make sure we have enough evidence to convict. Photos by themselves can be doctored or torn out of context, so I do not accept them as evidence without any other supporting material. Been there done that. The truth resonates in ecumenism and its obvious. I know you guys are smart enough to buck up and see the reality behind it. It takes a lot of strength to stand up against a bishop/metropolitan engaged in direct heresy and breaking the canon of the Holy Apostles. But you do not know that His Beatitude is guilty. You're just quick to condemn him because of your preconceived bias against ecumenism. You still do not appreciate the irony of claiming to represent Orthodoxy while worshiping with the Amish, do you? If it's not OK for me to attend a Roman Catholic church for prayer and worship, then it's not OK for you to attend an Amish church for prayer and worship. If you're going to natter on and on about your admiration for the Amish, then please shut up your crying about how Orthodox participate in ecumenism, for you have no room to talk. Practice what you preach and maybe we'll listen to you. So back to the beginning. Please make sure you have more than just photo evidence before you accuse an Orthodox bishop of engaging in illicit ecumenical relations. I have underlined and bolded the critical part. To me, this is buffet Christianity. If you dont like something, somehow you're free to violate other canons in order to stand up for some. This is no different than what Rome did, or what anyone does to you. People do not realize the situation in Greece at the turn of the 20th century whereby the devout were persecuted if they wanted to become monastics, if they wanted to celebrate an All-Night Vigil, if clergy wanted to wear beards and frocks, or if they wanted to observe the Julian Church Calendar which they had always observed until approximately 1920 when the New Calendar was imposed upon them. St. Nicholas Planas , who had met St. Nectarios, had to be tonsured in secret and could not wear his monastic garb because the modernistic metropolitan of Athens would not tolerate it. St. Nicholas would celebrate the All-Night vigil in secret coming into the church in the wee hours of the morning. Then he would visit other parishes to celebrate feast days according to the Julian Calendar. He was celebrating one of these All-Night Vigils on September 26 for the Exaltation of the Holy Cross in a rural parish of Athens when the Holy Cross miraculously appeared over the church causing the policemen to praise and worship the Lord. These policemen were sent to monitor the activities of devout Athenians who simply wanted to observe the Julian Calendar as their forefathers had. The Metropolitans who were imposing this New Calendar were also ecumenists. Metropolitans Meletios Metaxakis organized the Greek Archdiocese of North and South America under his jurisdiction as Metropolitan of Athens. Metropolitan Meletios was the one who imposed many hardships on St. Nicholas Planas and even called the saint to his office to harass him. There, St. Nicholas played like he was senile and in his second childhood to get the Met off his back. Saints do have a sense of humor. Im sure it was a spirit but maybe not the Holy Spirit. Was St. Nicholas Planas who was canonized by the Greek New Calendar Church under a spirit (not the Holy Spirit) when he lived? He abhored the New Calendar too. And as stated by Protopresbyter Michael Pomazansky in his third edition of Orthodox Dogmatic Theology published by the St. Herman of Alaska Brotherhood, "The unity of the Church is not violated because of temporary divisions of a nondogmatic nature. Differences between Churches arise frequently out of insufficient or incorrect information. 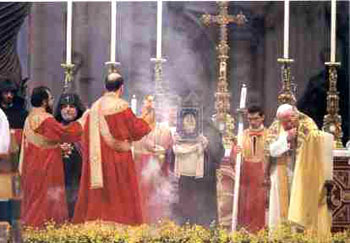 Also, sometimes a temporary breaking of communion is caused by the personal errors of individual hierarchs who stand at the head of one or another local Church; or it is caused by their violation of the canons of the Church, or by the violation of the submission of one territorial ecclesiastical group to another in accordance with anciently established tradition. Moreover, life shows us the possibility of disturbances within a local Church, which hinder the normal communion of other Churches with the given local Church until the outward manifestation and triumph of the defenders of authentic Orthodox truth. Finally, the bond between Churches can sometimes be violated for a long time by political conditions, as has often happened in history. In such cases, the division touches only outward relations, but does not touch or violate inward spiritual unity." Like all patristic, canonical, and historical quotes and references used by the self-styled TOC/GOC members to justify their departure from the Church, this quote does not in any way support or justify their schisms. It is a fact, as Fr. Michael pointed out, that individual local churches have broken communion with one another temporarily at various points in history due to issues of a nondogmatic nature. In such cases, when two local churches have broken communion with each other, for instance, they remained in communion with the Church by virtue of the fact that both local churches remained in communion with other local churches who recognized them as still Orthodox. ROCOR was never a local church but their breaking of communion with the Moscow Patriarchate was similar to such historical situations in that ROCOR and the Moscow Patriarchate both remained in communion with, and were recognized by, other local Orthodox churches during their period of separation. So, while there was no communion between these two synods (ROCOR and the MP), they remained in the body of Christ by remaining in communion with the entire rest of the Church. With regard to the so-called “TOCs”, none of them ever constituted a local church which was recognized as such by any other local Orthodox Church. Regarding the Greek Old Calendarists, the first synod of bishops was established in 1935 by three bishops from the Church of Greece, all of whom later repented of their schisms and sought to be received back into communion with the Church of Greece. Today’s “TOCs” from the Greek side have no apostolic succession from the Church of Greece but were created through uncanonical consecrations performed by disobedient and misguided bishops. The so-called “TOCs” were never part of the Church and do not have apostolic succession from bishops whose consecrations were recognized by any other local Orthodox churches. ROCOR was once sympathetic to some of these groups before they truly understood them, and some of ROCOR’s bishops made serious mistakes in this regard, but ROCOR has withdrawn all recognition from these groups and repented of these actions. Did he separate himself from the Church? Did he break communion? Has anyone heard of Bishop Aftimios Ofiesh? This ecumenist bishop set about ordaining and consecrating Anglican and Old Catholic priests and establishing uncanonical Western Rite Orthodox-Catholic Churches across America that still exist to this day. Finally, in 1933, Archbishop Aftimios married and was forced to retire. Reference: Again Magazine, Vol. 22, No. 1, Jan.-March 2000, p. 11 (see also the picture caption). In the life of St. Nicholas Planas that is published by the Greek Old Calendarist Holy Transfiguration Monastery, it is recorded that his chantor asked him which calendar should be followed, the Old or the New. His response was that he followed the Old out of preference but the New out of obedience. In other words, while he served at night on the Old Calendar out of preference, he did not see the calendar change as a justification for schism and he both modeled, and counseled, obedience to the hierarchs who adopted the New Calendar. St. Nicholas can hardly be held up as justification for schisms when he counseled and modeled the exact opposite.